A native of San Jose, California, Erick Ignacio Macias-Chavez knows what it means to be resilient. He grew up in the south side of San Jose where he attended Del Mar High School. South San Jose is known as a diverse community fraught with poverty and violence. Instead of becoming a product of his neighborhood, Eric made an intentional choice to focus on his education and seek opportunities to improve his life and his community. Growing up in a community with limited resources motivated Erick to become a role model to his family and peers. Earlier this year, Erick graduated from Del Mar High School and served as the senior class president. He also participated in various clubs at school, including the Del Mar High School Peer Mentorship Program, Culinary Club, Model United Nations, and Leo’s Club. He also volunteered at his church, Saint Lucy’s Parish by giving lectures and leading discussions with his peers. Erick also challenged himself academically and enrolled in Advanced Placement courses and maintained a grade point average above 3.0. Beginning this fall, Erick will attend West Valley College in Saratoga, California where he plans on majoring in Political Science and History with a special emphasis on the Latino community. He aspires to one day start his own nonprofit organization to improve his local community and share opportunities with area youth. 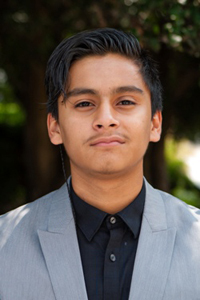 Erick participated in CHCI’s 2014 R2L NextGen program which helped him continue on his path towards success. He explains, “R2L NextGen helped me dream bigger! It allowed me to meet other students who, like me, want to improve their communities.” Erick is grateful for his experience because he now surrounds himself with other Latino leaders that encourage each other to be successful and improve the community. The CHCI familia is proud of all Erick has accomplished and is excited to support his educational journey.